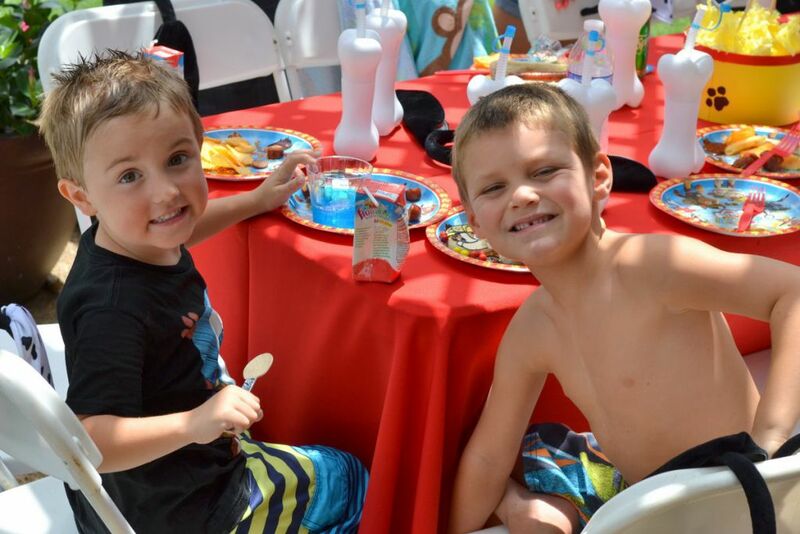 Check out Brittany’s post about a Firetruck party featuring a real fire truck! 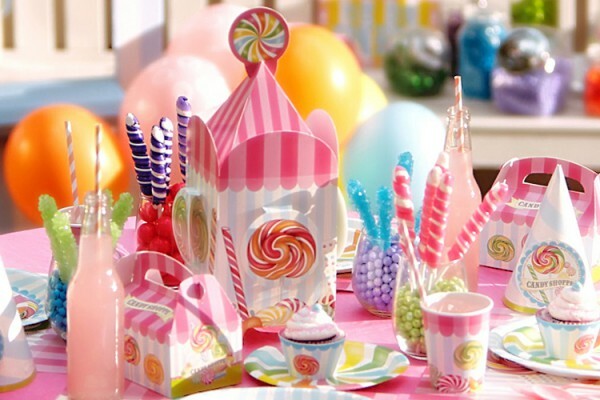 You might get a kick out of Brittany’s design for a championship Soccer party! 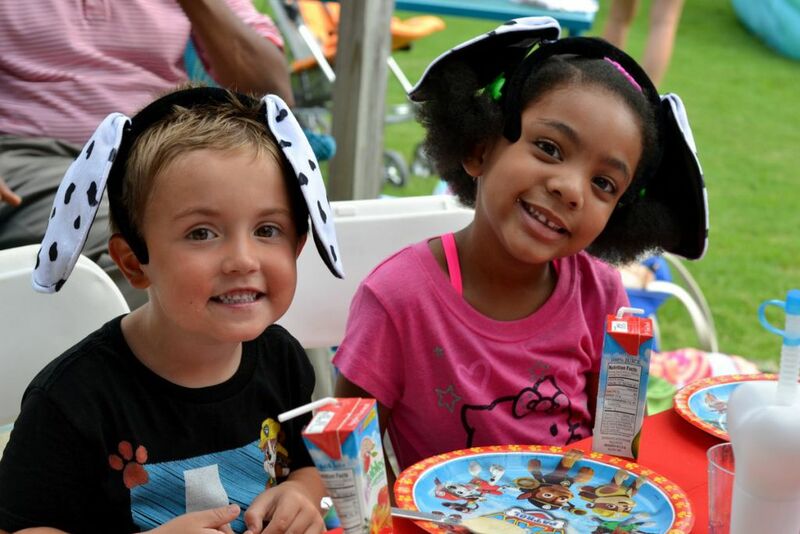 Or get some inspiration for your very own backyard Dinosaur party! 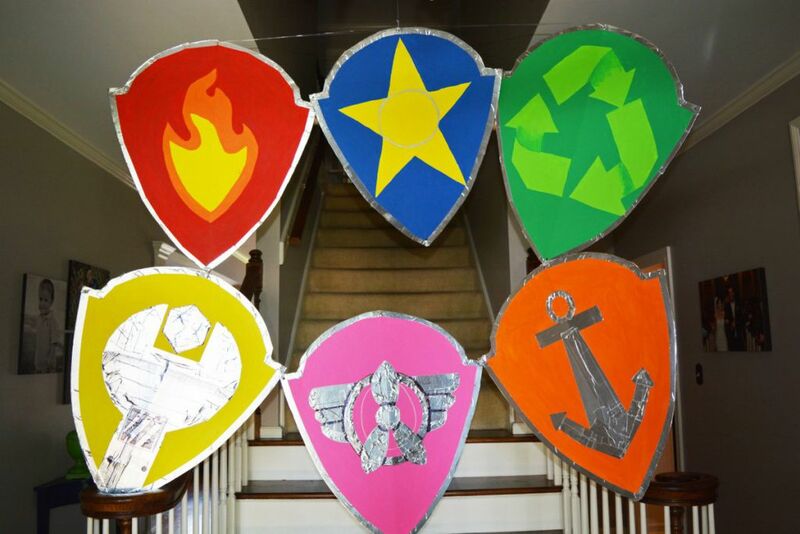 And have a look at a Brittany-designed party featuring our new Camo Army Soldier theme! 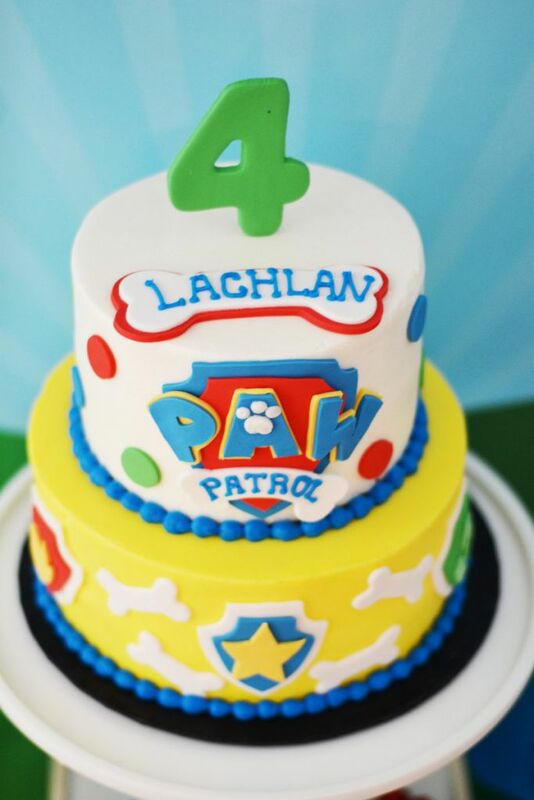 Paw Patrol, Paw Patrol, be there on the double! I don’t know about you, but in my house that song is on repeat 24/7! It gets stuck in my head all the time! 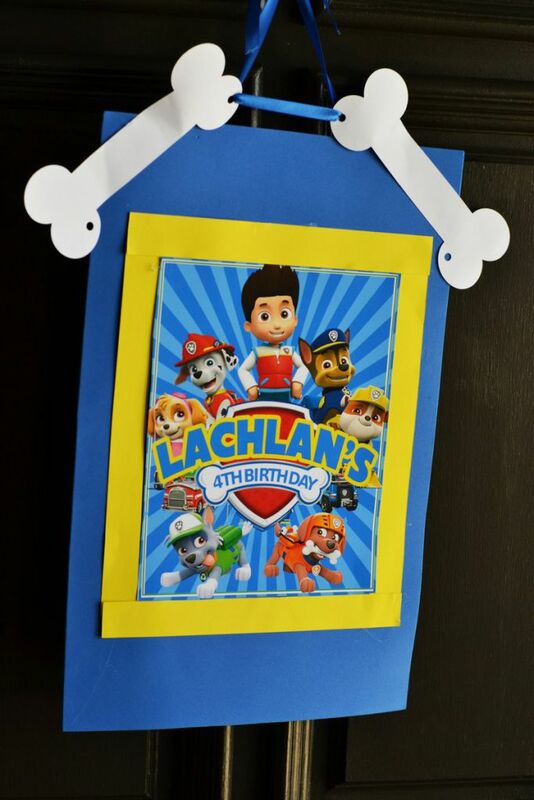 My son recently turned 4 and Paw Patrol was his pick for his birthday party theme this year. 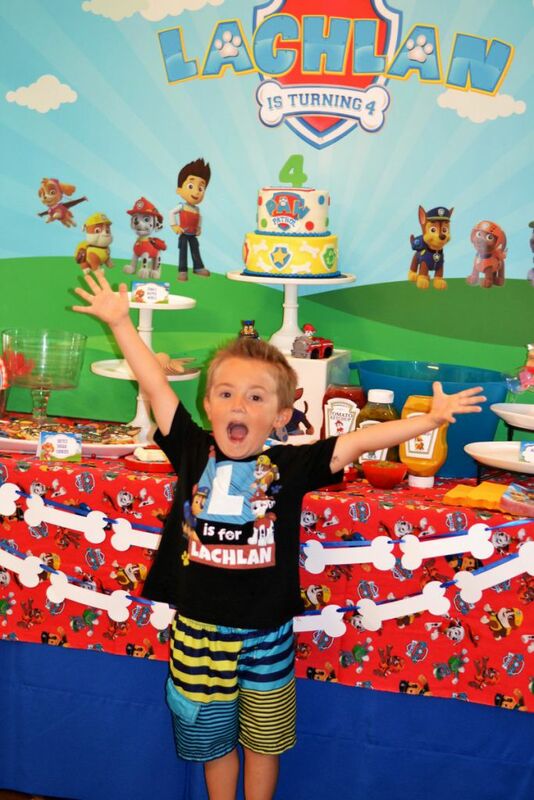 And if his friends are any indication, Paw Patrol is going to be a very hot party theme this year for the preschool set! 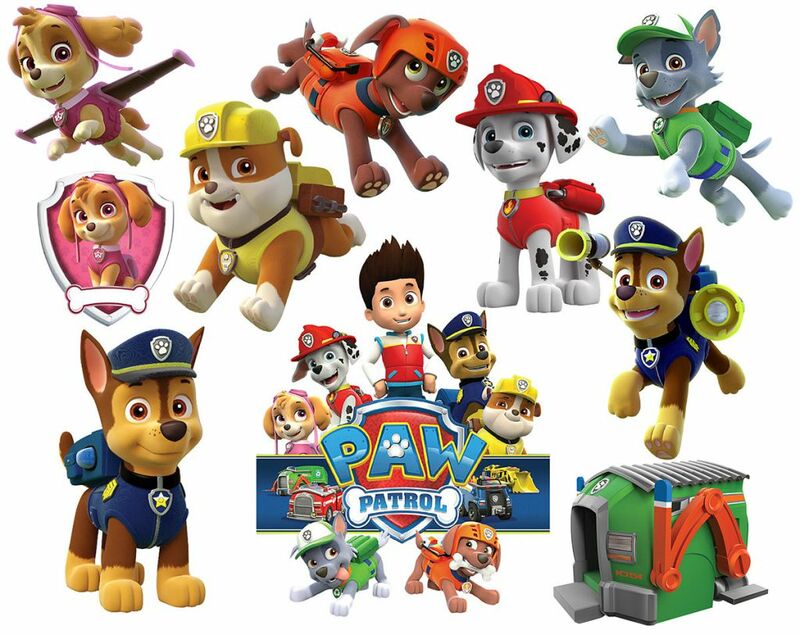 Paw Patrol is a very sweet show. It centers around a main character named Ryder and his team of breed-specific rescue dogs. My little guy can rattle off their names so fast that you can hardly keep up with him! But, for the uninitiated, their names are Marshall, Rubble, Chase, Rocky, Zuma, Skye, and the newest addition, Everest. 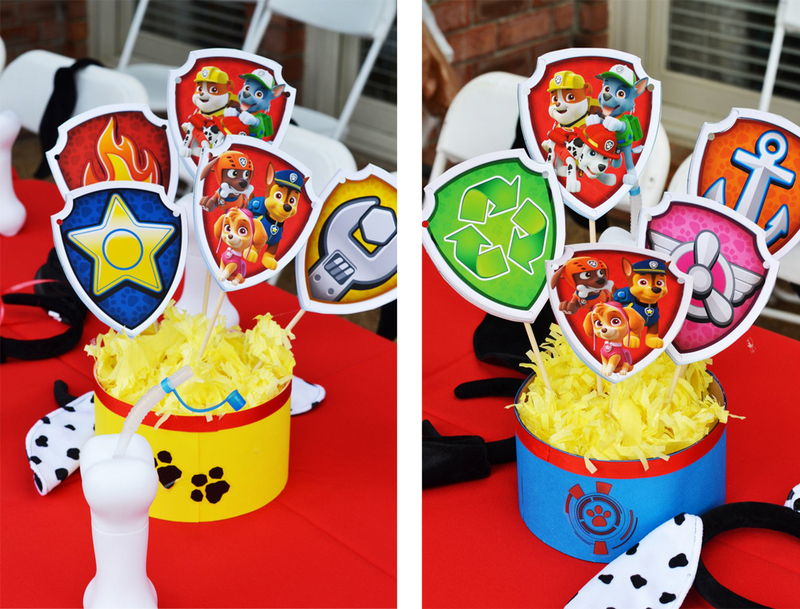 Click here to see a post about another Paw Patrol party designed by BirthdayExpress! 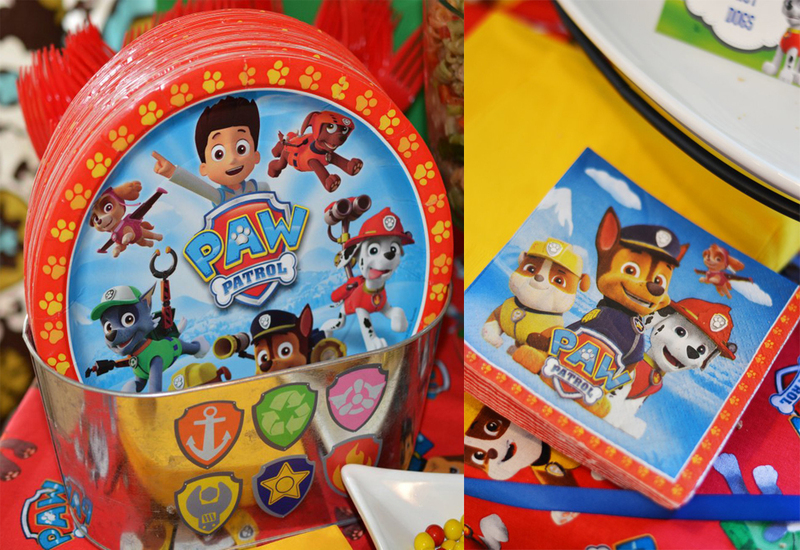 Since Paw Patrol is a newer show, all the party products are just now coming out and luckily for me (and you), Birthday Express has a TON of selection of cute Paw Patrol party supplies! 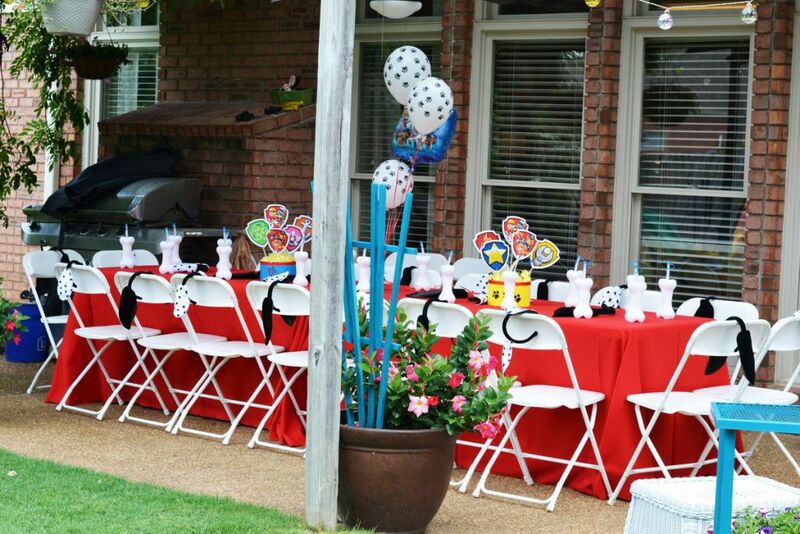 We had about 20 kids at our party, so I knew I needed to set up a very large table for them. 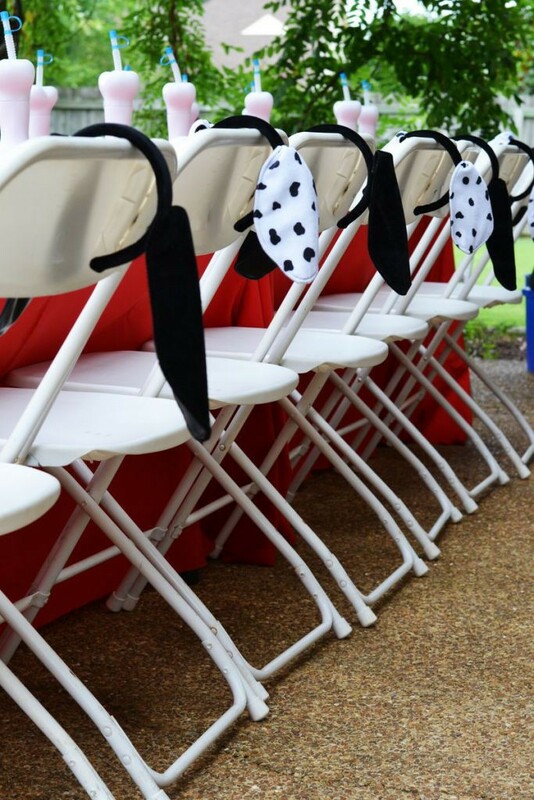 I set up two 6 foot-long tables with red linens and added these adorable puppy ears and dog bone straw cups from Birthday Express to each place setting. 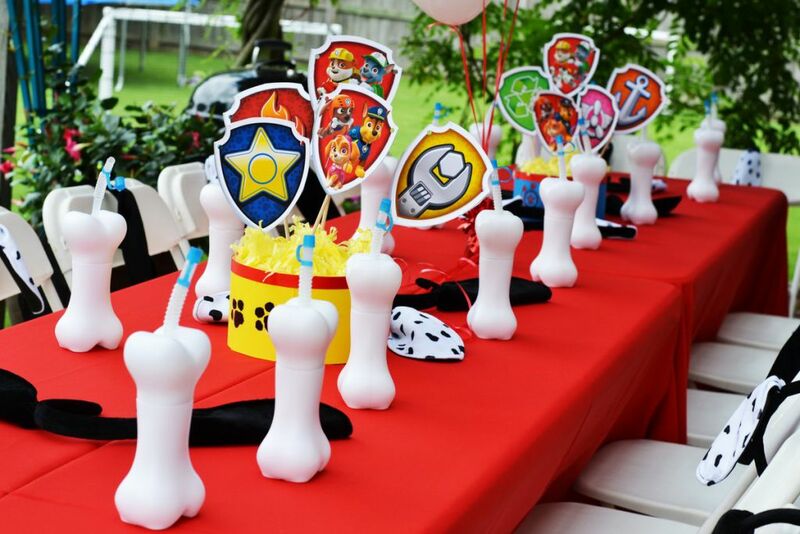 Then, I added some simple centerpieces made from hat boxes and Paw Patrol printables on bamboo skewers, and some cute themed balloons. You can’t get easier than that! 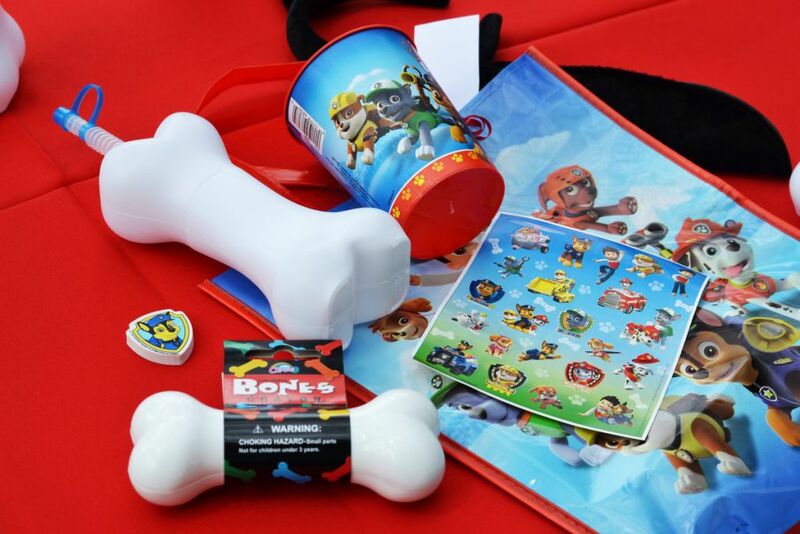 For the favors, each of the kids got a Paw Patrol “doggie bag” filled with a themed plastic cup, an eraser, some dog bone crayons, and a cute sheet of stickers. 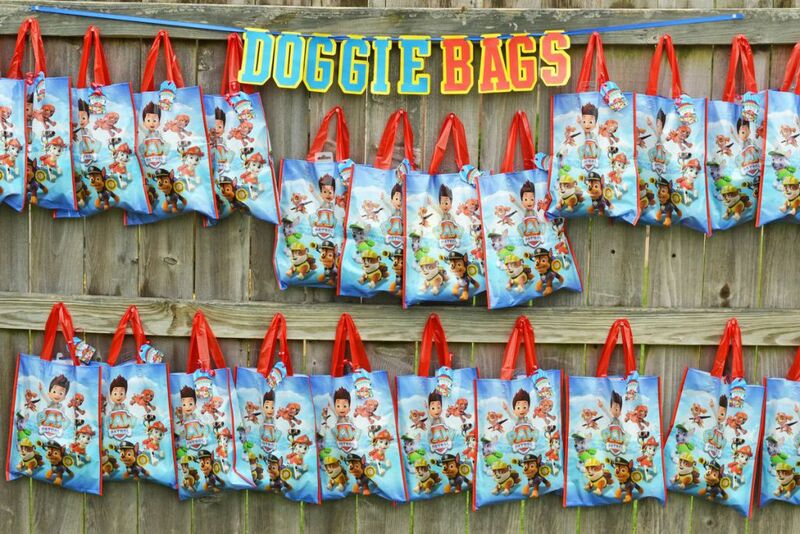 Then, they could use the bag to take home their bone cups and their dog ears. 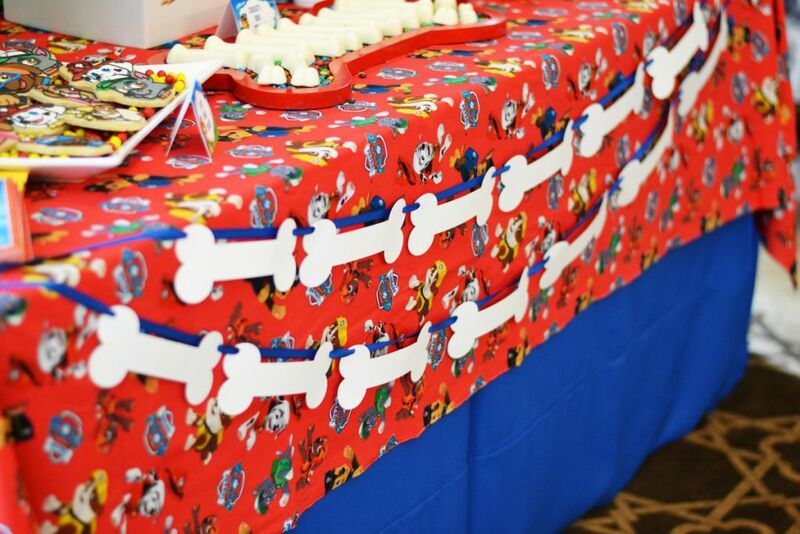 I made the simple “doggie bags” banner with my die-cut machine. 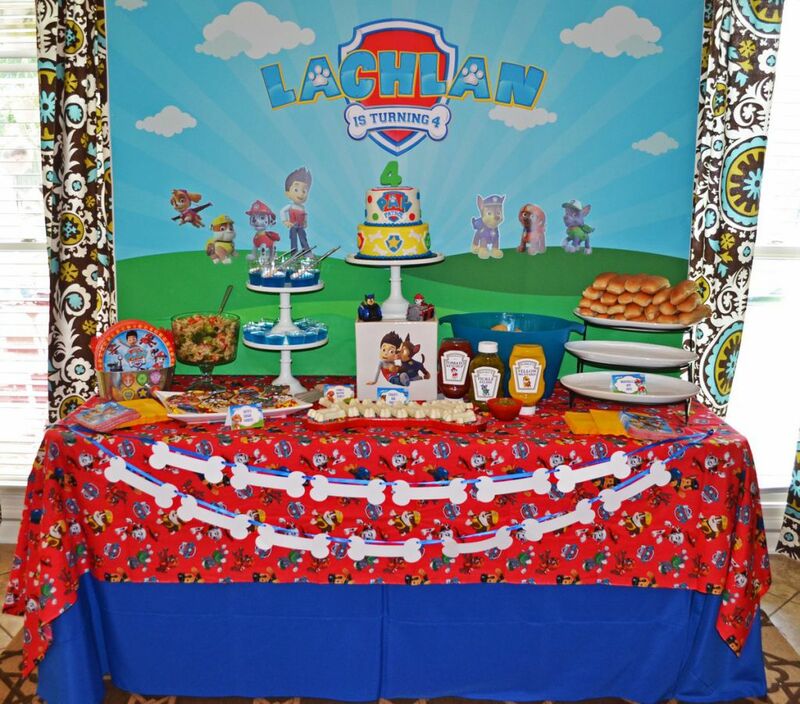 For the main dessert table, I had this backdrop designed by Party Pop Prints on Etsy and then printed by Print My Picture Online. 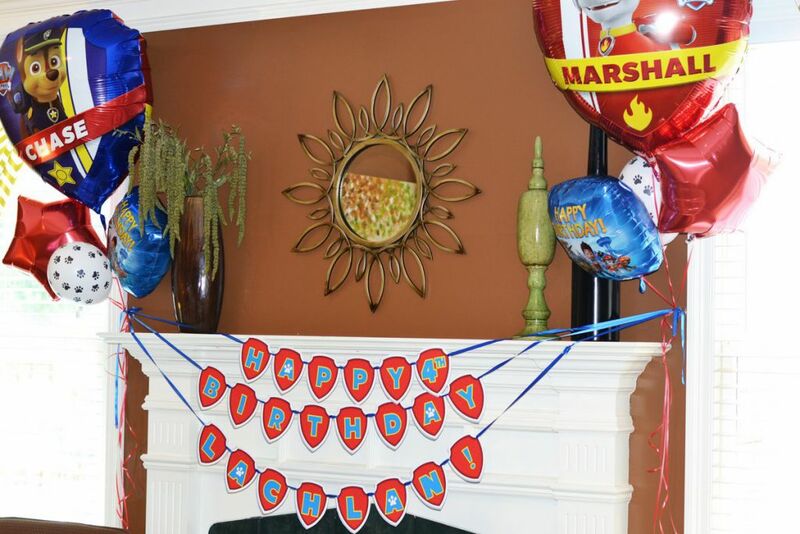 I added the characters from a vinyl wall decal package from Birthday Express. 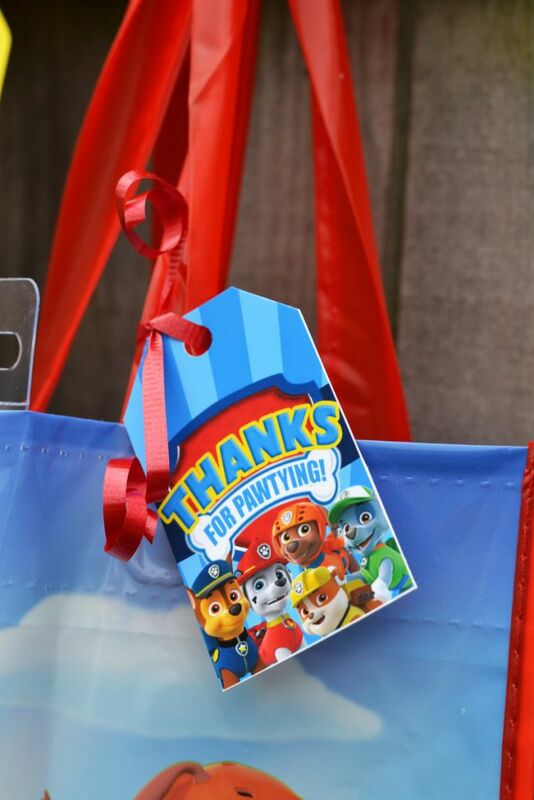 This package has a ton of large format stickers that I used all over the party. And he still has some left over to use in his room! I added a simple royal blue linen and then topped it with 3 yards of Paw Patrol fabric that I bought off of Ebay because it’s really hard to find lately! 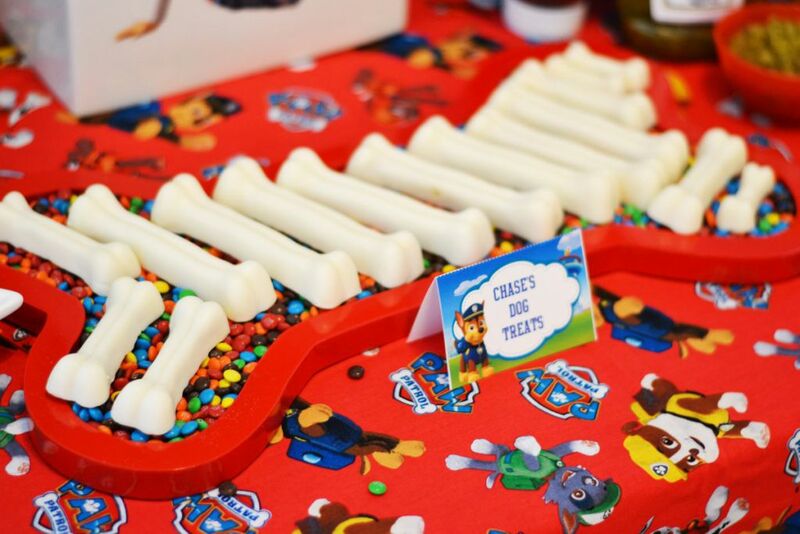 I added a simple bone shaped garland to the front of the table and we were all ready to go! 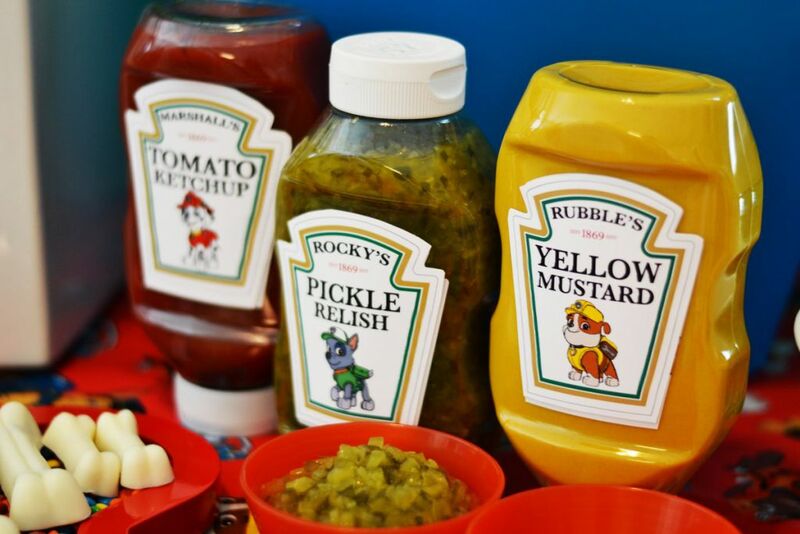 For our menu, we obviously had to have “Marshall’s hot dogs!” Every kid loves a hot dog, and adults usually do too! 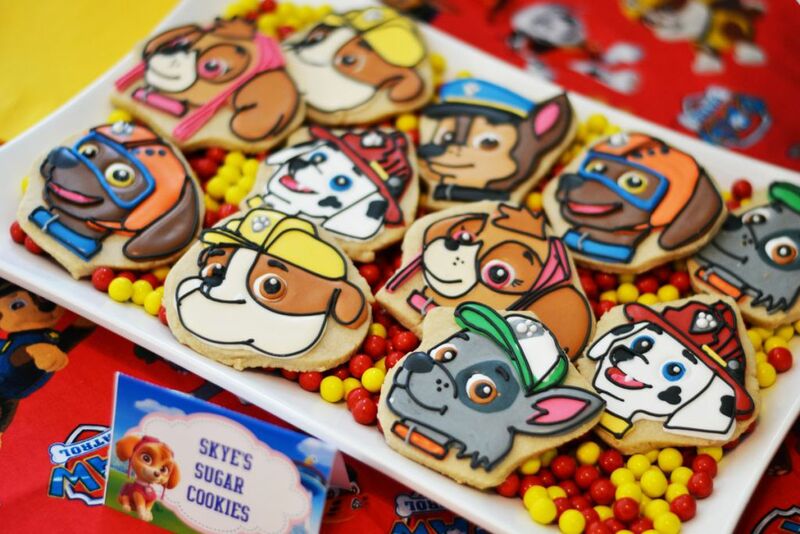 and these AMAZING sugar cookies by SemiSweet Confections for “Skye’s sugar cookies.” Lachlan was amazed by these and squealed when he saw them! 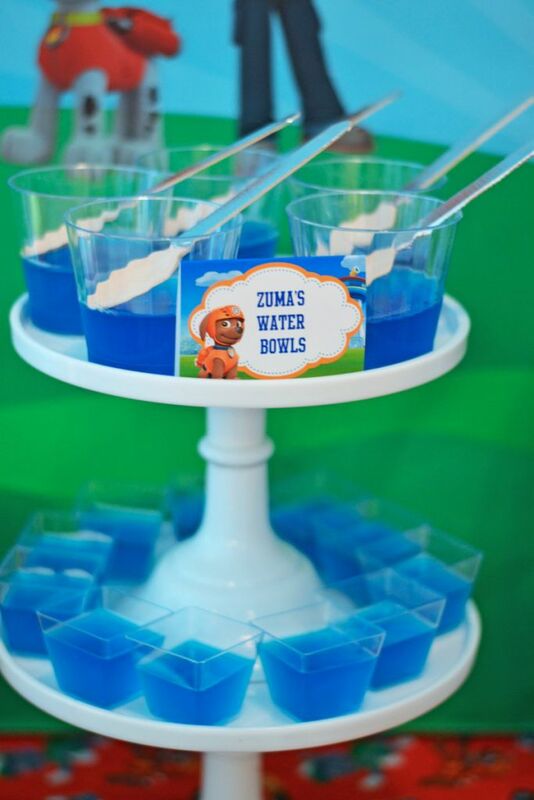 The only problem was that the kids wanted one of each character!! Everyone talked about how gorgeous and amazing they were. 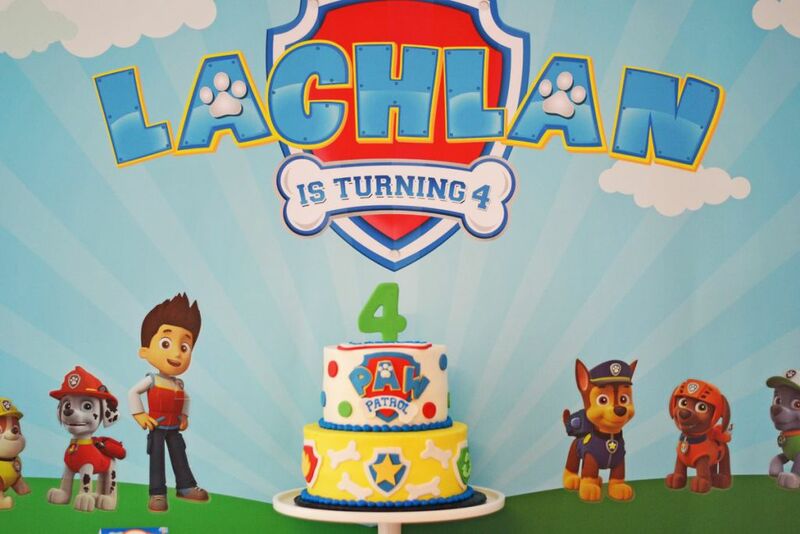 And, of course, we had a gorgeous cake for our 4 year old! 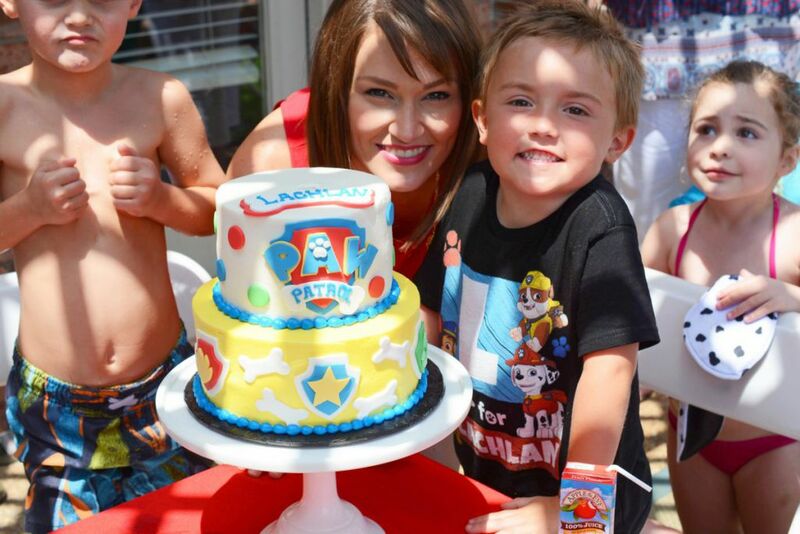 I’m sure you can tell by the pictures that my little guy had a pretty awesome time at his Paw Patrol party! 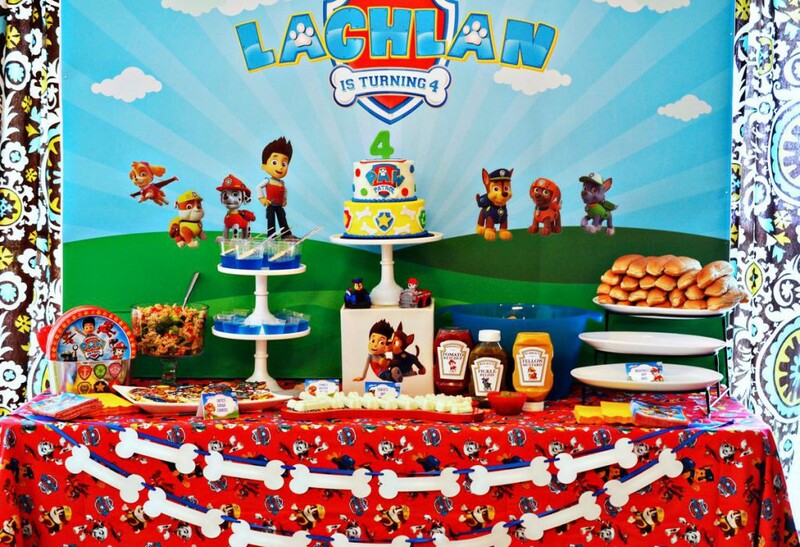 I hope this gives you some great ideas for Paw Patrol parties! I know there will be a lot of them coming your way soon! 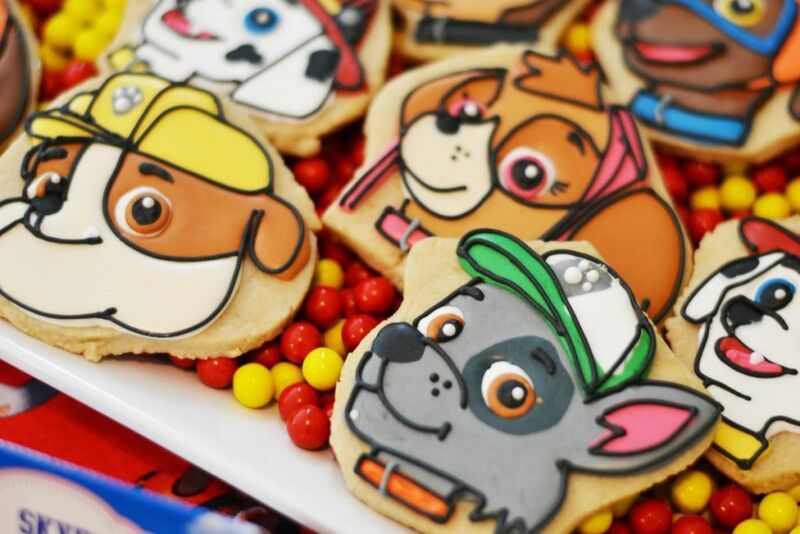 Did Brittany inspire you to throw a perfect Paw Patrol party for your little pup? then follow us on Twitter and Facebook, and tell us what you think!